From the remains of the Iron Age Hill Fort to the restored Holy Austin Rock Houses, people have been living in the area of Kinver Edge for thousands of years. Kinver Edge was created millions of years ago from wind-blown sand which had collected over time. The swirling patterns in the sandstone rock can still be seen in the walls and ceilings of the cave dwellings where water and the elements are gradually eroding away the soft sandstone rock. to show it as it would have been in Victorian times, complete with cooking stove, oil lamps, rag rugs and a basic kitchen. The communal well is now covered with ivy. The rock kept the dwellings cool in summer and warm in winter. However there was no sanitation, electricity or running water and the last inhabitants were forced to move to "better" homes in 1967 by a legislative order. The cliff-face houses generally had a living room and a bedroom with a separate store in the deepest and coolest parts of the caves. As you can imagine, the dwellings have always been a local attraction. 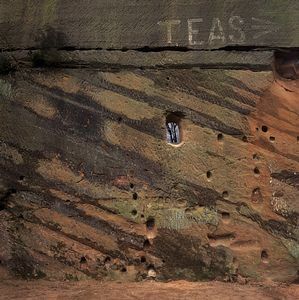 The troglodyte residents baked cakes on the cooking ranges built into the rock wall and sold them to curious tourists. Piped gas was provided for cooking and lighting and the pipes still lie under the sandy paths. The houses had sloped chimney flues to carry out the smoke, which can still be seen like a giant honeycomb in the walls. frames slotted into the openings to protect them from the elements. Now just the grooves can be seen and the long flight of steps cut into the rocks has long since been destroyed. Everything had to be carried up the hill, but the advantage of the position was the rewarding views which stretch for miles. These eleven Staffordshire houses are on three levels, with the upper levels being unrestored. There is an exhibition on site with information about the history of these unique homes and some old photographs. 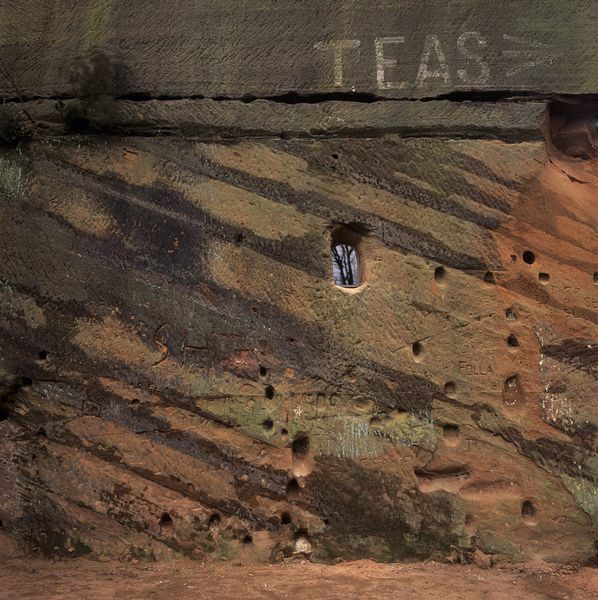 After exploring these unusual historic residences and the exhibition, Kinver Edge is ideal for exploring on foot as it has some of the best views of the Staffordshire countryside from the top of the escarpment. The local footpath follows part of the Staffordshire Way. 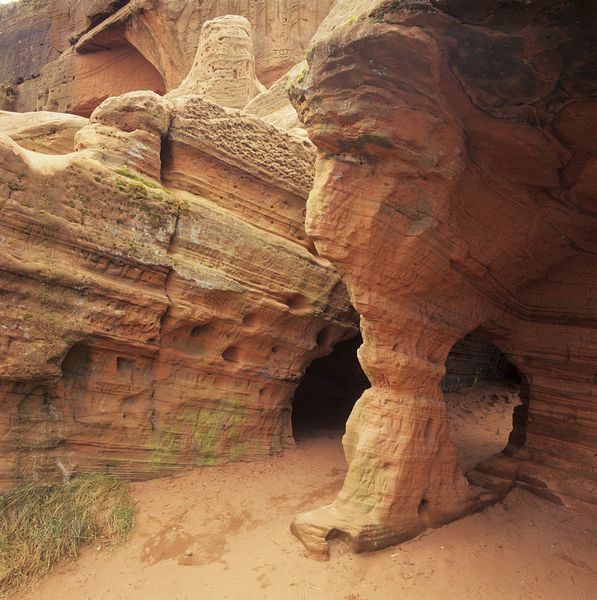 Further geological features in the area include Nanny's Rock, also made of the same stunning red coloured sandstone. Walks along the forested route will reveal ancient earthworks, criss-crossing footpaths and some perfect spots for enjoying a picnic, with views across the Severn Valley. 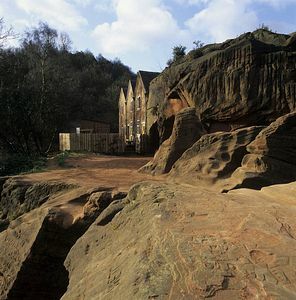 The rock houses are a short walk away from Kinver village. You can also walk up on to Kinver Edge from Kingswood to the southwest. The estate lies at the end of the Staffordshire Way, a popular 91 mile path to Mow Cop in Cheshire. It also links up with the North Worcestershire Way, which continues on to Major's Green, via the Clent Hills. National Cycle Network route 54 is 5 miles away at Stourbridge and 8 miles away at Kidderminster. Canal towpaths link to Kinver from both towns. A variety of bridleways enable off-road cycling through this area too. Regular weekday bus service 228 to Kinver village from Stourbridge bus station, near Stourbridge Town . Several buses a day from Kidderminster to Kinver. Stourbridge Town , Stourbridge Junction and Kidderminster are all about 6 miles away. The Staffordshire and Worcestershire canal is one mile's walk away from Kinver Edge. It links with the Stourbridge canal 2 miles north of the village. Both canals pass through some remarkable countryside and industrial scenery. For Kinver village, turn off the A458 between Bridgnorth and Stourbridge, or turn off the A449 between Kidderminster and Wolverhampton. OS: SO837829, free parking, suitable for coaches.